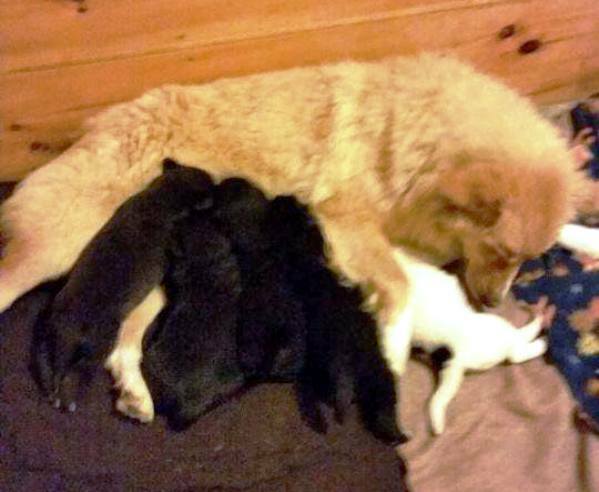 A rescued mother dog named Nala and her five puppies were on their way from Kentucky to a second chance at a shelter in Canada yesterday morning when tragedy struck. As the plane, piloted by Rameio Gonzales, a volunteer with the non-profit organization Pilots N Paws, took off from Bluegrass Airport in Lexington, a door in the cargo hold opened. Nala fell out and landed on a road, dying instantly. The woman who arranged the flight told WKYT that a bandana Nala was wearing may have gotten caught in the door, causing it to open. Gonzales returned to Bluegrass Airport. At first, two of the puppies were thought to have also fallen from the plane, but they were found safe inside. All five puppies are now back at their foster home in Lexington. Pilots N Paws, founded in 2008, has safely flown more than 75,000 homeless dogs and other animals to shelters where they have a better chance of being adopted, thanks to private pilots who volunteer their time. Last month its executive director, Kate Quinn, told the Associated Press that more than 5,000 pilots flew over 15,000 dogs to new homes each of the past two years. Gonzales was donating his time and plane to transport Nala and her puppies, and was paying all the expenses. “I really feel terrible because there were some people that trust me with their puppies, and I just don’t know what happened,” he told WLEX. Gonzales identified the rescue organization as “Pilots for Paws.” As of Saturday morning, Pilots N Paws has not released a statement about the incident.